Solo by Rana Dasgupta is a diptych of a novel composed of two related but independent halves. In the first half, a blind, 100-year-old Bulgarian man named Ulrich reminiscences about his life from the vantage point of his squalid apartment overlooking a train station in Sofia, the Bulgarian town in which Ulrich spent the vast majority of his life. Though graphically limited, Ulrich’s life touches many of the important moments in modern history, beginning with the last years of the Ottoman Empire and continuing through both World Wars, the Nazi and Russian occupations, post-war Communism, and eventually up to contemporary, independent Bulgaria. Ulrich’s imaginative life is just as vivid as his actual life, and the second half of Solo is made up of Ulrich’s daydreams. Beginning as a series of distinct stories and characters, Ulrich’s daydreams become gradually more intricate and interrelated. Ulrich’s imaginative “children” include a young, ambitious Georgian woman and her shiftless brother, a Bulgarian musical prodigy, and an American executive of a record company. Their stories converge in contemporary New York City, where Ulrich inserts himself as a character in his own daydreams. 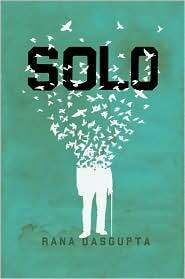 Solo is published in the United States by Houghton Mifflin Harcourt. Earlier this year Solo won the Commonwealth Writers’ Prize in the UK and the inaugural “Not the Booker” prize awarded by the Guardian newspaper.